Baymen Garden Building A - First Floor Completed! I must admit, it's fun watching the first Baymen Garden condo building take shape, right from our backyard.Â Every day I walk out the back door and wonder what type of equipment IÂll see, how many guys will be working, and what comes next. 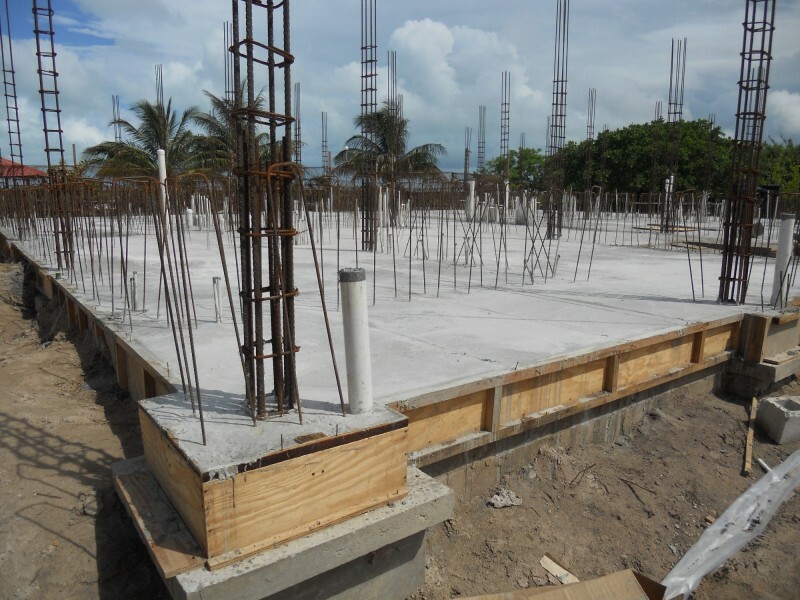 Construction started around the middle of June, when Mike and I were blissfully vacationing in France.Â Now, a bit more than six weeks later, the concrete first floor has been completed and is in place.Â Â Soon the walls will be going up. The pictures in this post illustrate the work in progress, over a three day period. 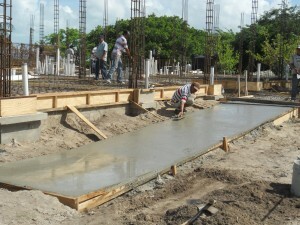 The first day workers poured the ramp up to the first floor. Â Actually, this ramp was included in the design to meet the accessibility needs for our special first floor handicap unit. Â There arenÂt any handicap accessible units on this island that we know of. Â We wanted to offer the first one. The ramp provided an extra benefit.Â The workers could more easily push wheel barrow after wheel barrow of wet concrete up the ramps on the next day. Â The contractor has a regular crew of guys.Â But on Saturday he needed extra guys.Â The entire first floor pour had to be completed in a single day. We all kept our fingers crossed there would be no downpours to impact the work or slow down the pace. Â Fortunately, the weather cooperated. Two cement mixers always in action. 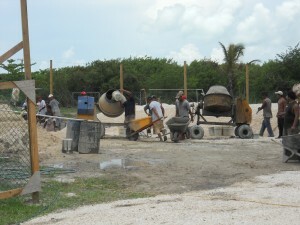 Â A steady stream of workers pushed wheel barrows of cement from the mixers up the ramps to the building. Â They would dump the wet concrete wherever the next section needed to be poured. Â Other guys smoothed it out as quickly as possible. 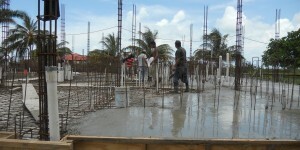 This is the Belizean way - plenty of pure physical labor.Â Most of these guys regularly put in a long day of demanding work. Â In the USA, they would have pumped the concrete onto the floor, rather than have the laborers undertake this much manual work. It was indeed a long day.Â I have several pictures of the guys working at dusk.